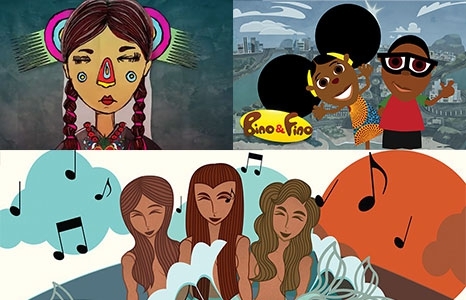 The second program brings together short animated films from Aztec, Tuvaluan, Nigerian, Chamoru, Mexican, and Hawaiian cultures. Join us before and after each film with a meet and greet from local comic book artists and cultural content publishers. A story of in the Uto-Aztecan language of the Náhuatl about language preservation. Every tongue in the world encompass an entire universe inside, and when they die a vision is lost, and so are the doors and windows to different world views and cosmogonies. Directed by George Siosi Samuels. 2 min. Tuvaluan. Te Lima tells the story of an ancient Nanumean (Tuvaluan) power that is unique to only a select few families. However, over time, its power has been both elusive and mystical. Directed by Adamu Waziri. 11 min. Nigerian. Bino and Fino learn about the mighty walls of the Benin Kingdom that is now located in Nigeria. The walls of Benin rivaled the Great Wall of China in length but very few know about them. Created by Ken and Angela Paulino. 5 min. Chamoru. Kottura Innovations shares their unique vision with interactive augmented reality Chamoru books from the island of Guam. Directed and animated by Ashley Graham, Kate Reynolds, and Lindsey St. Pierre. 4 min. Mexican. A beautifully heartfelt, short film about a little girl who visits the land of the dead, where she learns the true meaning of the Mexican holiday Dia de los Muertos. Brought to you by The CG Bros. Directed by Cynthia Y. H. Derosier. 60 min. Hawaiian. Pa‘a Ke Aupuni is a 60-minute hand-drawn, animated film that zooms in on key facts explaining how the Hawaiian Kingdom came to be, how it evolved to stand firmly on the international world stage as a sovereign nation, and how the United States came to claim Hawai‘i.